Nanoscale Fabrication, Optimization, Scale-up and Biological Aspects of Pharmaceutical Nanotechnology focuses on the fabrication, optimization, scale-up and biological aspects of pharmaceutical nanotechnology. In particular, the following aspects of nanoparticle preparation methods are discussed: the need for less toxic reagents, simplification of the procedure to allow economic scale-up, and optimization to improve yield and entrapment efficiency. 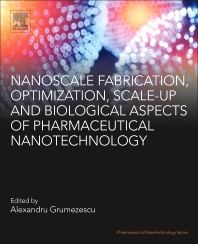 Written by a diverse range of international researchers, the chapters examine characterization and manufacturing of nanomaterials for pharmaceutical applications. Regulatory and policy aspects are also discussed. This book is a valuable reference resource for researchers in both academia and the pharmaceutical industry who want to learn more about how nanomaterials can best be utilized.